Istanbul is a great place to shop. The biggest problem for us tourists is that there are so much beautiful to choose from, much at a very reasonable price, compared with what you would had to pay at home. If you travel by plane, you will have clear limitations to how much you are allowed to bring with you. My dream is to bring a car, and fill it up with goods. Here is information on what to buy, and what not to buy, when staying by the Bosporus. Carpets from Turkey and other Middle Eastern countries are on display in the Grand Bazaar and in many other areas in Istanbul. They vary in prices according to age, quality and provenance. 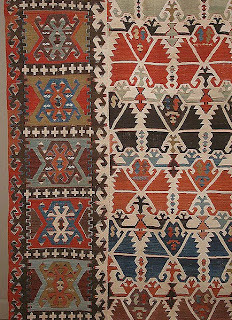 Do look for Turkish kelims, as these colourful woven rugs are widely available, and you'll will always find one matching your taste and your budget. 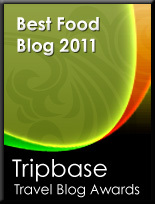 Do look for something you like, and do not believe all that the vendors try to tell you. When you have found the carpet you'd like to buy, you are expected to haggle. If you play your cards well, you can really get a bargain. Look around, and do not make up your mind immediately. Start haggling at half the offered price, and try to reach an acceptable middle ground. If you try to leave, you may strengthen your bid even further, and if you actually leave the shop, you may return the next day to an even better price. When I was a kid, many elderly men wore hats made from karakul pelts. In my home town this fur was called persianer, but in Istanbul it was called Astrakhan. I saw quite a few men wearing these hats in Istanbul, and I thought they looked so smart and distinguished. I decided to try to find one for myself, and I did find a shop, in the middle of the great bazaar. The many different hats were sold by a Russian, and they were expensive. 230 Turkish lire, or around €130 per hat. That was the point that even I managed to haggle, and the final price ended at 190 TL. If the vendor had not been Russian, I think I would have succeeded in getting an even better price. Now I wear my Astrakhan hat proudly, every day. 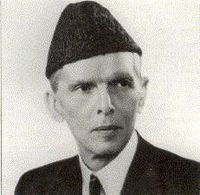 The Fez is the iconic Turkish hat, round with a flat top. If you do not want in astrakhan fur, a fez is an eccentric choice for those of you looking for a hat. It does not cost much, but may be difficult to bring, as it cannot be folded together. As I had bought my hat, the nearest thing I got to a fez, was when the staff placed this Turkish hat on my head during a photo session at Cennet restaurant in Sultanahmet. 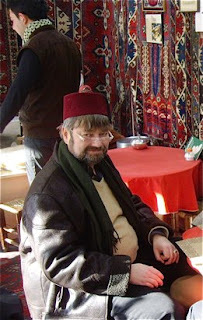 When seeing this pot-bellied man(read; me) in a fez, I fear that this is not my cup of tea. 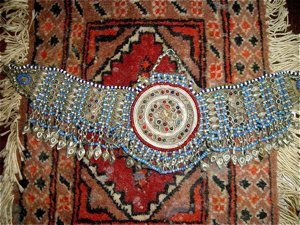 Another specialty are Turkish slippers, pointed and heavily embroidered, an all colours. You can get them in all qualities, from mass-produced, cheap (and clearly not silk) to the real thing, special made, high quality and very expensive slippers. Most of them are highly decorative, and absolutely a thing to buy for yourself or a gift. I bought a pair for my American cousin, as gift the next time I cross the Herring pond in September 2010. Everywhere you find the most beautiful, colourful lamps in all sizes. Having one in your flat would provide a striking feature in your interior design. They are highly ornate, with brilliantly coloured glass. Sadly, they are often in sizes that make them difficult to bring home, if traveling on a plane. An alternative is to ask the store to pack and ship it for you. If choosing that option, do your shopping in a reliable shop. If not, you may risk that you pay a lot, without getting anything delivered to your door. 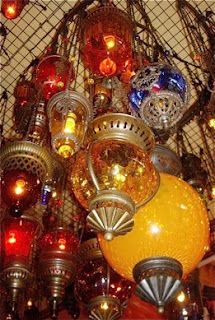 I would LOVE to buy a pair of lamps for my flat the next time I visit Istanbul. One of the best ways of bringing back a piece of Turkey, home with you is to buy spices and herbs. Then you can recreate some of the flavours you have enjoyed in your own kitchen. You can buy spices everywhere in Istanbul. 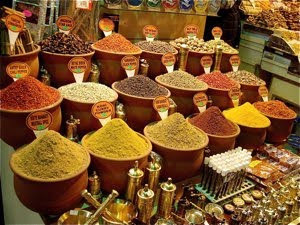 The best place is the Spice Bazaar, also called the Egyptian Bazaar by the New Mosque close to the Galata Bridge. If you move towards the narrow streets surrounding the Rüstem Paca Mosque you'll find spice shops equally good, and much cheaper. What to buy? There is no shortage of different blends. I bought a large bag of Star Anise, dried mint, a strong spice mix for meat and dried mulberries. Wandering around in the Grand Bazaar, you may find the strangest things for sale. I always look for something with character, that I can bring to our summer home. 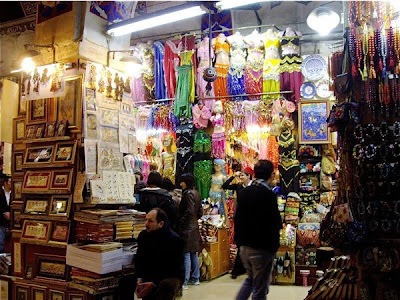 This time, I walked into some Turkmen merchants selling rustic jewelry. I looked through case upon case of beautiful rings, ornaments, bracelets, and pendants. I found a few ornaments that I suspect have been displayed on folk costumes. As I inquired their provenance, I was told that they were from the early to mid 19th century and originating from Afghanistan. This to avoid buying objects subjected to Turkish legislation on antiques. For those with a sweet tooth, you are recommended to buy a box (or two) of Turkish delights to bring home. These cubic, multi coloured sweets are made from starch and sugar and flavoured with lemon, mastic or roseater, and dusted with icing sugar in order for them not to stick to each other. They are around the city, and you can buy different sized boxes with your own selection, and you pay according to weight. 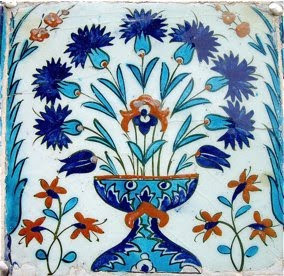 Turkey is an old country, and all over Istanbul you find shops selling antique carpets, icons, prints, paintings, maps, home decorations, furniture, glassware, old weapons. For those of you planning to buy antiques, be aware that it is strictly illegal to bring out artifacts made before 1900. The penalties are severe, and you are not to be tempted. There is also a large market for fake antiques, for sale at high prices. You may be tricked as well as punished if you try to bring out even a fake, if you believed it to be genuine. I found this display of Russian and Iranian caviar in the Spice Bazaar. You may find these delicacies all around Istanbul, but I would never recommend anyone to buy them. A senseless quest for this delicacy has brought the sturgeon to the brink of extinction. 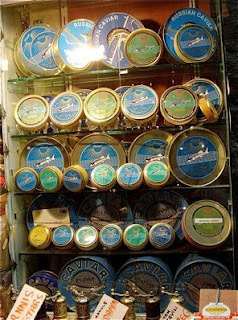 For every box of caviar, big or small, you support an industry based on exploitation, and crime. 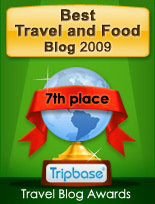 So pass these shops - there are so much more delicacies to choose when going home.